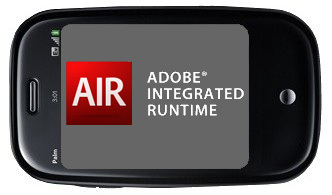 We already knew that Flash is coming to webOS, but today, during an Adobe conference at Moble World Congress, it was announced that Adobe is bring their Adobe Integrated Runtime (AIR) to smartphones, including webOS. This move by Adobe is part of their efforts to entice developers over, and really it's quite smart. Developers will only need to make a single AIR application and that will be deployable on all major smartphone platforms. Keen readers might remember how back in September we reported on how Flash 10.1 would include support multi-touch and accelerometers. Well, evidently Adobe's continuing down that route and Gizmodo is reporting multi-touch support is present in the Android port at the very least. From the sounds of it, AIR will be debuting on the Android and will launch on other platforms, including webOS thereafter. This is an interesting announcement to say the least. It'll definitely be fascinating to see how events unravel from here.